My favorite part of my job has always been writing. Putting words on a page and having them appeal to people, make sense to people, and educate people. I love that part. Remember: Successful content marketing isn’t always just about the content. Sometimes the marketing aspect needs to take center stage. Paid advertising is becoming one of the most cost-effective ways to get your online content in front of your targeted audience. The advertising strategies I’ll be discussing in this article can increase your readership, generate leads, and increase brand awareness — all in the specific audience you want to reach. Ten years ago, many brands weren’t advertising much at all. True, some put out newspaper or radio ads or ran a little something in the Yellow Pages, but most did not. It was simply too expensive, too hard to track ROI, and too difficult to reach the people you wanted to reach. Online advertising changed all that. Suddenly, your brand — and your content — could be put in front of thousands of people for a fraction of what it used to cost. 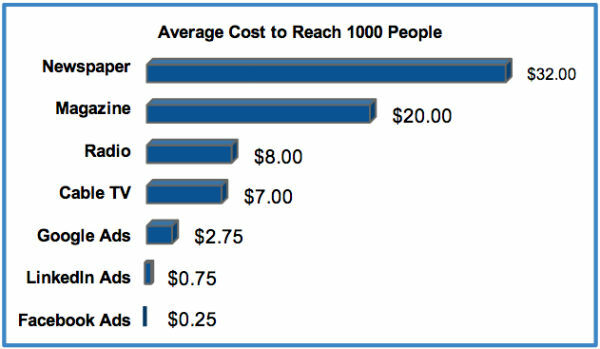 According to Moz.com, the cost to reach 1,000 people with a newspaper ad is, on average, $32. The cost to reach 1,000 people with Google Adwords is $2.75. Facebook ads? Just 25 cents. Let me repeat that: It costs your business only a dollar a day to put your content in front of 4,000 Facebook users. And your investment is fully trackable, in terms of interest, clicks, and conversions. Facebook ads are, very simply, one of the cheapest ways to increase brand awareness. But why use online advertising for content marketing? Well, why not use online advertising for your content marketing efforts? Don’t we need to put our content in front of as large an audience as an ecommerce business would for its fall product line? I admit, when I first started learning about and running Facebook ads I was somewhat opposed to using them to promote my content — from a “moral” standpoint more than anything else: I wanted my audience to support and read my content because I was a good writer with interesting and insightful things to say. I still want that; but I’ve come to the realization that online advertising doesn’t take that stuff away. There is nothing wrong with taking every avenue, trying every strategy, to bring more attention to what you have to say. As I said, successful content marketing isn’t just about content creation; it’s also about the marketing of that content you’ve created. The ability to promote your content with paid ads, ensuring it gets seen and engaged with by your business’ target market, is incredibly valuable. But if your content itself isn’t of a high quality; if it doesn’t speak to the issues of your market and isn’t optimized for both search and social media, you will be still disappointed by the results you achieve. Sidebar ads are the cheapest options, though they also have the lowest average click-through rates. News Feed ads are the most expensive and have the highest average click-through rates. As the name suggests, Mobile News Feed ads are specifically designed for display on mobile devices. Pricing: There are two primary pricing structures: pay-per-click (PPC or CPC) and pay-per-impression (PPM or CPM) — an impression being 1,000 views of your ad. How many people will see your ad: Your targeted audience and your ad budget both help determine the number of users who will see your ad on Facebook. When you create your ad and decide on your target audience (more on this later), you will see the “Potential Reach” of your advertisement on Facebook — “Reach” being the amount of people who may see your ad. Your Facebook ad goes into the Facebook ad auction (this is why you need to set your “Maximum Bid” within the Facebook ad builder). Within the ad auction, your ad competes against other ads for the same targeted audience. How much of that target audience your ad gets shown to is based on your ad budget. If your target audience is not within a competitive market, the amount you’ll need to bid to reach enough of them will be lower. No matter your bid, your ad will be shown on Facebook to a portion of its “Potential Reach” audience. 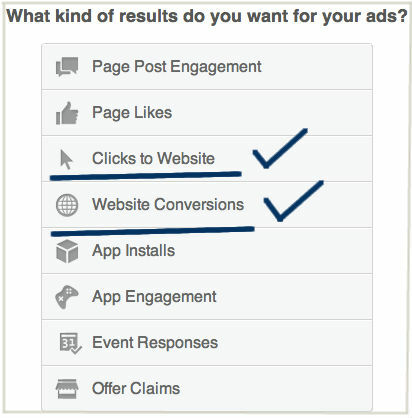 “Clicks to a Website” allows you to drive Facebook traffic to your blog, resources, or a lead-generating landing page. “Website Conversions” allow you to drive Facebook traffic to your blog, and then track the behavior of that traffic (they’ve given you an email address or subscribed to your RSS feed, for example). However, you will need something called a “Conversion Tracking Pixel” placed within your site in order to see results. The targeting capabilities of Facebook ads are what make them worth your time and money. Targeting ensures your ad will be seen by the people you want to click on it — i.e., those who are most likely to want to engage with your content. Let me be clear here: Whenever your Facebook ad is seen by someone who is unlikely to engage with it, you are wasting money. Fortunately, Facebook ads can be targeted so specifically that there’s no reason for them to be seen by someone unlikely to engage. 1. Demographic targeting: The most straightforward targeting strategy with Facebook ads is demographics: age, gender, location, etc., as well as the more specific demographic categories like sexual orientation, relationship status, workplace, and education level. 2. Precise targeting: This is where ad targeting gets fun. Precise targeting allows you to show your promoted content exclusively to people who have expressed interest in your subject matter. Interest targeting is based on a user’s stated “likes” and interests, and allows advertisers to home in on their optimal content audience. 3. Broad category targeting: Broad category targeting allows you to target your ads to Facebook users based on, essentially, the categories those users can be placed in. Some examples include people whose marital status indicates that they are engaged, people who are expecting a baby, small business owners, hold a particular political stance, etc. Think about it this way: What if your content focused on strategies to deal with a hormonal teenager stomping around your house in combat boots? How convenient would it be to target an ad based on the broad category seen below? However, to be honest with you, even this target audience is far too large. We want people who are defined by having a teenager in the house. Many of the 29,000,000 Canadian Facebook users in the audience you see above simply happen to be parents. Perhaps we want to find users who not only have a teenage child but also have an interest in teen psychology. The most important part of precise and broad category targeting is finding a balance. You need to be showing your Facebook ad to enough people that a click-through rate of 0.1 percent brings in enough readers for it to make sense, but few enough that those readers are actually interested in your content and will return to read again. 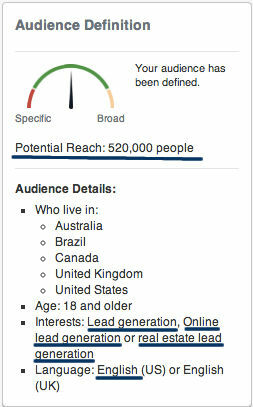 Tip: I recommend keeping your Facebook ad’s “Potential Reach” between 100,000 and 500,000, depending on your ad budget. There are multiple strategies you can use to target your Facebook ads toward the right individuals, rather than sending them out into the Facebook ether and hoping for an echo. Custom audience targeting: Any business with a business page on Facebook will be able to see the “Custom Audience” box at the top of the “Audience” window (right above the “Locations” box). Custom audience targeting is when you import your existing contact database (RSS feed subscribers; clients or customers; newsletter subscribers; eBook subscribers, etc.) into Facebook’s ad tool. Facebook will find the user profiles that correspond with your provided email addresses, and allow you to target an ad just to those individuals. Now, custom audience targeting is all well and good (and a great way to generate Facebook page “likes,” I might add), but it’s not particularly useful for increasing your readership: These are people who are already reading your content, so there’s little need to pay to put more content in front of them. Lookalike audience targeting: This targeting method is currently only available through the Google Chrome plug-in Power Editor or some third-party Facebook ad tools, and it requires an already-imported custom audience (which is why I mentioned it earlier). Basically, with lookalike targeting, Facebook takes the custom audience you’ve defined and analyzes the demographic and interest characteristics of users, selecting the ones who fit the profile. It then groups those users as a newly-defined “lookalike” audience. The lookalike audience you’ve created is, by definition, similar to your existing readers. It’s made up of people who are interested in the same things, have the same job titles, have the same demographic characteristics, etc. Basically, your lookalike audience is your ideal target audience: that group of readers who would love your content — if only they knew it existed. Create a lookalike audience from your existing blog subscribers. Select a piece of content — an eBook, white paper, case study, etc. — to make available for free for a period of time (ideally this should be content that you were previously offering behind an email gate or other form of pay wall). 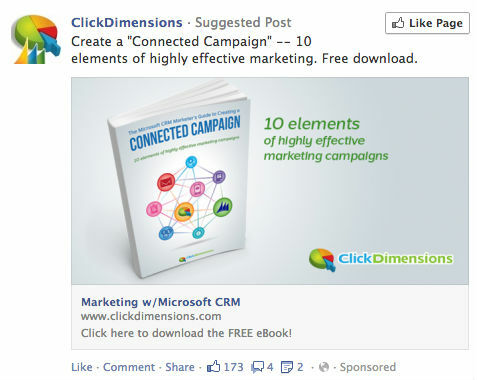 Create a Facebook ad that promotes this content and target it to your lookalike audience. Ensure the Facebook ad mentions the exclusivity or limited-time availability of your content. This strategy will put your content in front of readers interested in its subject matter. It will also highlight your reputation as a trusted source of information, and help to increase your brand and name recognition in the future. Sometimes content marketing isn’t about the content your business creates. Sometimes it’s about what the content creates for your business. Facebook ads can also have a huge influence on the creation of that list of subscribers you use for lookalike audience targeting. In fact, increased lead generation is one of the top goals I recommend using Facebook ads to achieve. Let’s say I have created an eBook specifically about my marketing company’s strategies for real estate lead-gen. Rather than target my ad at every marketer in every English-speaking country in the world, why don’t I try something like this? This will give my ad a possible reach of a little more than 500,000 people. Depending on my maximum bid, the ad could be shown to anywhere from one-tenth to one-half of this number. Now, consider that, if I’ve optimized my content ad with general best practices, it could have a click-through rate of around .15 percent. Let’s say that, over the course of a month-long ad campaign, my Facebook ad will be seen by 225,000 users. Converting at .15 percent, I’ll get around 338 clicks through to my lead-generating landing page. So, if the landing page is converting leads at a rate of, oh let’s say 25 percent. This will provide me with approximately 85 email addresses at a price of $7.50 per lead. Anyone who uses Google Analytics will likely have, at some point, checked out its “Real-Time” traffic. This is a graph within the analytics tool that shows how many people are currently on your blog or website. Google can give you their country of origin and the specific page or article they’re currently on. No, seriously. Although only available through third-party software providers, Facebook ad retargeting allows you to track your bounced blog traffic back to Facebook. Your chosen retargeting provider gives you a pixel that you can place within the code of your blog (or anywhere else on your site). Web traffic comes to your site from any source (e.g., search, advertising, syndicated content, social links, etc.). Users check out your site, see what’s going on, and then bounce. When they return to Facebook, your content-oriented Facebook ad will follow them and show within their News Feed — driving them back to your content, or just simply making them more aware of your business. The pixel you’re provided can be placed on any page of your website. So, what if you put it on a lead-generating landing page? When (or if) you find that site traffic to that page isn’t converting as well as you would like it to, you would set up a retargeted ad to appear the next time those visitors are logged into Facebook. The ad would be optimized to drive them back to that landing page (for example, by offering something of value that will get them engaged). Let’s say I went over to the landing page of scheduling software company, When I Work. Before I clicked through to its free trial or submitted my email to “start scheduling,” though, I got sidetracked by something on one of the other 17 tabs I currently have open on my browser. Incidentally, third-party retargeting provider Adroll has quoted that retargeted Facebook ads have anywhere between 2,000 and 4,000 percent higher click-through rates than traditional Facebook ads. I’ll remind you once again that Facebook ads promoting your content should only be used in conjunction with good content. For best results, I recommend your custom audience be at least 10,000-strong in order to create a lookalike audience that will get you results. Lookalike audiences can be either generated with 5 percent similarity (creating a larger, but less specific audience) or 1 percent specificity (creating a smaller, but more similar audience). Test the results you get from both to see which works best for you or your business. Consider segmenting the leads you get from email gating your eBooks into subject matter, thereby optimizing the marketing emails you can send those leads. Ensure your Facebook ads are designed to engage. Use bright colors for your image that contrast with the Facebook newsfeed; include the value of engagement within the headline or body copy (for instance, “Learn how to generate leads for your business“); ensure your ad has a call-to-action that tells people how to engage. A/B split test your Facebook ads, for example, by keeping the headline and body copy the same but changing the image to see which visual has the highest click-through rate. Hopefully you’ve gotten a better idea of how Facebook ads can be used to support your content strategy. And hopefully I haven’t exhausted you too much. 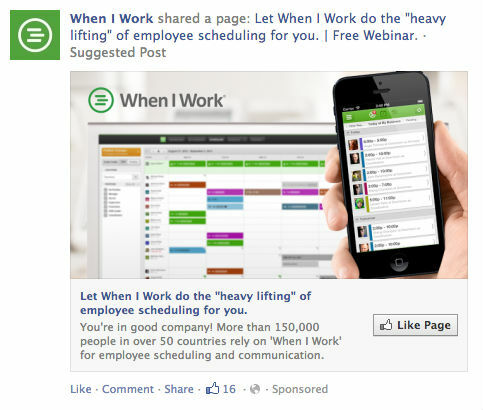 Have you promoted content with Facebook ads before? What were your successes? Frustrations? Start the conversation below. Find more tips for using Facebook Ads and other platforms to increase the impact of your content. Read our Content Marketer’s Guide to Social Media Survival: 50+ Tips.